It must be those cards. They’re made of plutonium mixed with nitro-glycerine, with the edges sharpened to razors. Then they’re heated to a million degrees Celsius and fitted with miniaturised massive weapons. Finally, they are rubbed on the skin of an Amazonian Dart Frog and left to dry in Vegemite. Why have Mark and Ben got targets on their hi-viz jackets? Maybe it’s in case CPR is needed, so that the paramedics know where ‘the right areas’ are. Their hearts are in the right place. More specifically, their hearts are in the upper right place. Medically speaking, that means that their hearts aren’t in the right place. Mark is not wearing a hi viz jacket. He is simply riding the one with blinkers while wearing the yellow jersey with cross-hatching and a white cap. I think you almost answered your own question, Bert. Those are not targets, they are radioactive warning badges caused by their cards. If you look very carefully their cards also say Active which may be the reason that they are currently the only 3 members. Even in a very slow news week for cricket, you manage to find a hot topic to discuss. Maybe they’re playing a game of squash – this is the right uniform and number of players, I’m reliably informed. They’ll have to swap their cricket sticks for squash bats however! I am a member! Er, that doesn’t sound right. Membership is county-wide so I am pretty sure there are more than 4 of us. 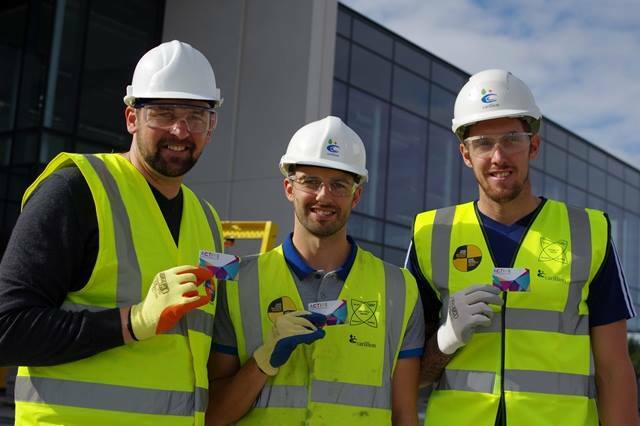 “England cricket stars Mark Wood and Steve Harmison have been bowled over by a developing leisure facility in their home town. The fast bowlers, both of whom have inspired their country to Ashes series victories and played for Durham, have signed up as the first official members of the new leisure centre in their native Ashington. After some further research it appears they are not the first 3 members, very strange.